We are happy to write to you to confirm we received the AED Kit last March, 22th. It coincidentally arrived at same day we had confirmed with our Fireman Institution about the possibility to have them supporting us with Heart Safe Project as partners. We will talk to them to find a date to have our first training (here we can not say it is a “training”, but it is like a “speech”, because even having theory and practice - as a class teaching - about recognizing to prevent deaths caused by sudden cardiac arrest, there are some officials rules about how we can refer to the event). 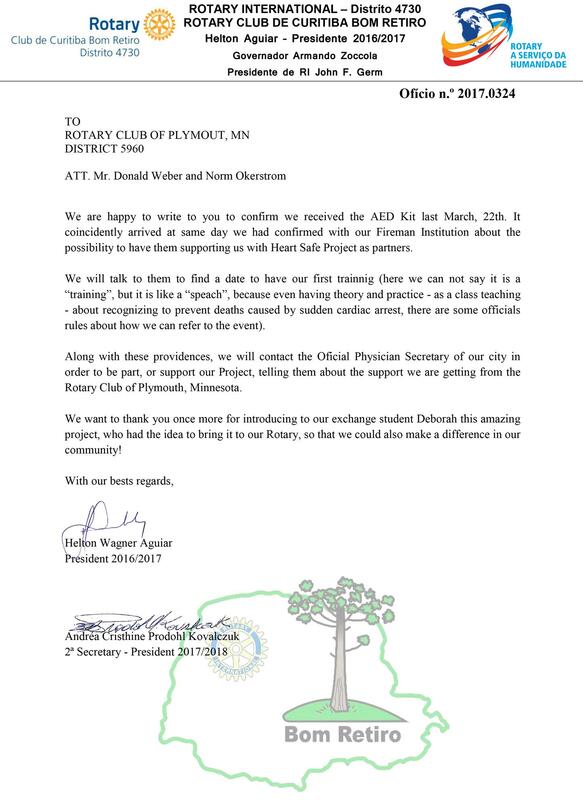 Along with these providences, we will contact the Official Physician Secretary of our city in order to be part, or support our Project, telling them about the support we are getting from the Rotary Club of Plymouth, Minnesota. We want to thank you once more for introducing to our exchange student Deborah this amazing project, who had the idea to bring it to our Rotary, so that we could also make a difference in our community!